Alrighty, so you have a water storage goal amount and you’ve decided what containers you want to store your water in. Let’s get to it and get those containers filled with life saving water! But storing water is a bit more involved that simply adding it to the containers. This isn’t always possible, especially if you are just getting started and the free 2 liter bottles are the route you are going. However, as you progress through your emergency preparedness projects, consider switching out your clear containers for more opaque containers. Algae and bacteria have a harder time growing when the sun can’t get to them! Most 55 gallon barrels are opaque, water bricks are opaque and I think these opaque 5 gallons barrels are worth the extra money. No matter what container you decide to use, you should make absolutely certain that it is clean before you add water to it. This is quite simple. Just add four cups of water and one teaspoon bleach to the container (or more, but the same ratio for larger containers). Put the lid on and shake / roll it around until you are certain that every inside surface has been touched. Then, pour the bleach solution out. Rinse well. Done! Make sure you use household bleach without thickeners, scents, or additives. Whenever possible, keep your water storage out of direct light (even with opaque containers) and away from high temperatures. Dark rooms with stable temperatures are best. I know this isn’t always possible. I stored our water on our back porch in the California sun for years. Step #4: Choose a location away from freezing temperatures. While freezing temperatures may inhibit bacteria growth, if your water freezes, it will be much more difficult to you. It may also bust the container it is in. Option #2: Commercial Water Treatment. I use Aquamira. This treatment will keep your water safe for up to 5 years and does not change the taste of the water at all. However, it is more expensive than bleach. Price varies, but it usually around $0.22 – $0.28 / gallon treated. This method can be used with chlorinated municipal water to extend its shelf life. Even with all the above precautions, your water may still become contaminated. How often you rotate it (meaning, remove the old water, sterilize the container and re-fill / re-treat the water) depends on a lot of factors. If you are using opaque containers and they are in your basement cold storage, you could likely get away with waiting a few years before you rotate it. If you are using clear containers and they are in the sun / heat, I would suggest rotating as often as every 3-6 months. If your water is treated with the Aquamira and it out of the sun, you can wait 5 years. If it is treated with the Aquamira but is IN the sun, I’d rotate it more often. If you have a water filter with a large capacity, you could not worry about rotation at all and just filter all water as you need it. There are inexpensive home water test kits that will test your water for bacteria, lead, pesticides, nitrites, chlorine etc. 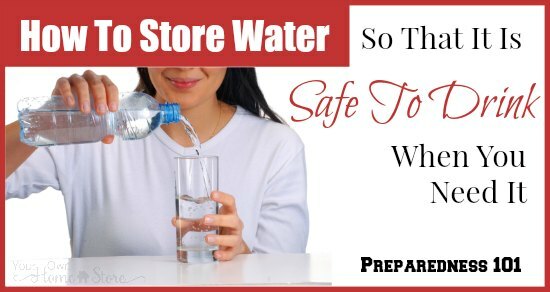 They will tell you if your water meets EPA standards (is safe to drink). I highly recommend buying and keeping a few of these on hand so you can test your water when / if you need to use it. If the time comes to use your water and you are unsure of it’s safety, you should purify it before using it. Some people don’t worry about pre-treating or rotating their water and simply plan on purifying it when they need it. In the next Prep-101 chapter we will talk more about purification methods. Stored water can taste funny. Sometimes it is the bleach, sometimes it is simply the lack of oxygen from sitting so long. You can improve the taste by pouring it back and forth between two glasses a few times. If you add bleach to your water, you might also consider storing drink mixes to make it a bit more palatable. Where can I buy water bricks? I live in Utah, and the only place I have to store our 2 55gal blue water containers is in the garage. It gets down to freezing in there. That is my only option. I plan to treat with Aquamira, what else can I do to prevent freezing, other than not filling it all the way full? It will freeze in my garage in the winter. I kept mine in my garage in the winter in Utah for a year and it did not freeze – and it was a very cold winter (down to -10 at times). It would have to be below freezing in the garage for a long time to freeze that much water solid. If it is an attached garage, I doubt it will stay below 32 degrees long enough. If it is unattached, I would just make sure you don’t fill it all the way. I don’t know of anything else you can do. 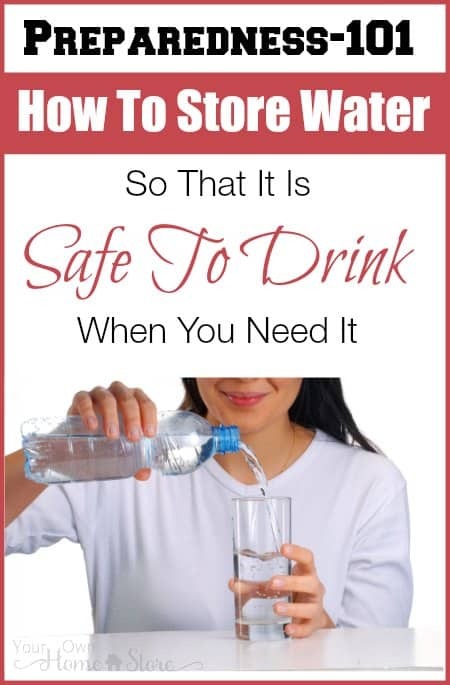 That are some great tips for storing water and making sure that it is safe to drink. Misty your article is worth reading i am going to share it on my blog http://www.cannedwater.com/ . Thankyou so much for these amazing tips. Thank you for the article on storing water. It’s a good reminder of what we should be doing. 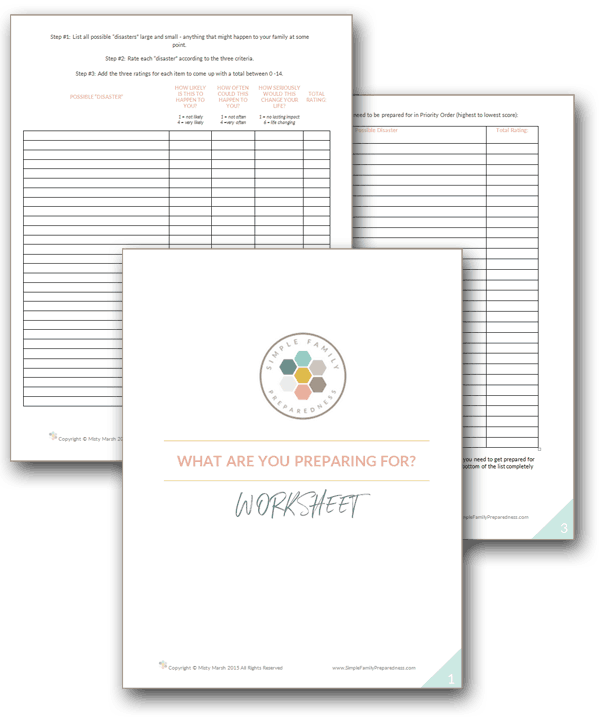 I’ve pinned it and also printed off a copy so I can add it to my preparedness binder (the binder is accessible even when the grid is down and the local internet server isn’t functioning). I went cross eyed looking over all the different water testing kits available on your link and was wondering which one you use? I use this one Muriel, but there was nothing special about choosing it. It had a high rating, was affordable and tested for bacteria which is what is most important to me for safety. You can always filter the water if you don’t rotate it. But there are some who haven’t been able to buy a filter yet and / or it doesn’t have a very large capacity. So, rotation is a good option in that case. We have a cool dark storage area in our garage, we have in a dark corner several gallons of store bought water, we have two opaque 5 gallon containers in the same area…we also have an IBC outside. Our yard is well shaded, but he also put it at the back of his shop, put a roof over it and lattice around it to shade it. It is sterile, it had contained 180 proof alcohol. We will be filling it with our well water. We have a Berkey Water filter to use so we know our water will be clean and safe to drink…the IBC holds 275 gallons of water, and as I mentioned we have a well, which we purchased a hand pump for so if we have to we can do it the old fashion way to get our water out! Sounds like you are all set Pamela! I would love a well!